I returned to the monotony and satisfaction of my London life. Password resets. Grumpy CEOs with broken Blackberry’s and Friday nights pissed in the pub. Occasionally I would pop into the local Buddhist centre in London but never engaged fully in the meditations. I suppose that is what the highs and lows are all about. Short bursts of madness, followed by long bouts of monotony. As soon as I had decided to get back on the spiritual track, strange coincidences started to happen around me. People I had not heard from for quite a while suddenly came into view. 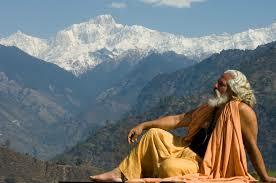 Nigel was one of them, a Buddhist like me who had given up the rat race for a life of Dharma. He managed to do this by selling weed on the side. Just enough to get by. ‘Are you smoking, Nigel?’ I asked. ‘No. I’ve given all that stuff up. It’s really bad for you.’ If I knew Nigel, this was highly unlikely. ‘Anyway, I’ve been thinking of doing some more retreats and wanted your advice.’ But before I could continue he breathed to me in hushed tones. Clearly Nigel was too far gone to make any sense, but the idea of India just popped in my head like a lightbulb turning on. It was meant to be. Well it wasn’t meant to be but in order to justify this extra holiday it was important to dress it up in pseudo-spiritual jargon. India was the birthplace of all religions. Where the Buddha himself became enlightened. There were plenty of mad Yogis wandering around, I’m sure I could pick up a trick or two. I was already firing up the laptop and trawling the net for airline tickets to India. Next Why are unemployed mentally ill people commiting suicide?